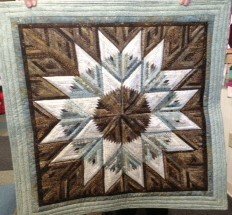 The Diamond Log Cabin pattern contains instructions and enough tissue paper foundations to make one wall quilt that measures 26 1/2in x 26 1/2in. Sort your scraps into lights and darks, and have fun stitching this Log Cabin variation. This is an intermediate class.